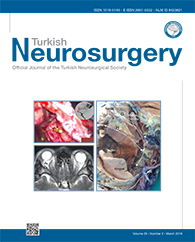 5Bakirkoy Sadi Konuk Education and Research Hospital, Neurosurgery Clinic, Istanbul, Turkey DOI : 10.5137/1019-5149.JTN.22169-17.2 AIM: To evaluate the cerebrospinal fluid (CSF) flow dynamics in the aqueductus sylvii of patients with obstructive hydrocephalus who underwent endoscopic third ventriculostomy (ETV) and to predict ventriculostomy patency via aqueduct flow measurements. MATERIAL and METHODS:Twenty-four patients with obstructive hydrocephalus caused by primary aqueduct stenosis who underwent ETV were included in the study. All the patients underwent conventional and cine magnetic resonance imaging before and after treatment. The flow of CSF in the aqueduct of Sylvius and prepontine cistern was assessed, and the diameter of the third ventricle was also measured. Increase in the aqueduct flow velocity after a successful ETV was supported by the assumption physical model that highlights a possible mechanism that explains the clinical findings. RESULTS: The flow pattern and velocity in the prepontine cistern and aqueduct were normal in 17 out of 24 patients who responded to ETV clinically. However, seven patients who did not respond to ETV had an abnormal flow pattern in both the prepontine cistern and aqueduct.